The eyes of a German shepherd are always on the lookout. As cuddly as a teddy bear to those that care for them and cold as ice to those that don’t, German shepherds love friends, fun and food. They’re not too fond of lazy days, and they definitely don’t like knocks on the door. But they’re eager to please and even more eager to see what’s hiding in the bushes. German shepherds love their owners, but aren’t so fond of strangers. Properly trained and socialized shepherds aren’t aggressive with strangers, but they make it known that they don’t want someone they’re not familiar with to cross into their territory. In addition to being a bit standoffish with strangers, shepherds belt out a vicious-sounding bark when anyone knocks on your door. And they won’t hesitate to protect the ones who love them if danger would arise. They’re especially – and sometimes to a fault – protective of children. German shepherds need a way to burn off some energy, because they have a lot. They demand daily walks and playtime. If they’re not properly exercised, they’ll often respond by being destructive, barking, running around wildly inside the house and generally acting out. Synonymous with intelligence, German shepherds were ranked third when more than 200 AKC judges rated over 100 breeds on their intelligence. They’re easy to train, learning many simple commands in as little as five repetitions. A German shepherd isn’t one to stay away from something because he’s not sure what it is. They love exploring their surroundings, often checking out a yard’s boundary when they go outside each day. Their curiosity is especially noticeable when they’re puppies, getting into everything they can get their paws and nose on. German shepherds can nearly instantly break into top speed, come to a sudden stop and round a sharp corner without stumbling over themselves or their surroundings. It’s one of the many reasons they’re often used as a police and military dog. Puppies are considerably less graceful, because of their lengthy limbs they can’t quite handle. 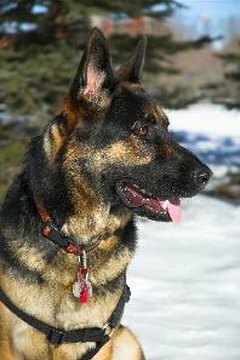 Although German shepherds suffer from many types of medical conditions, they’re most commonly associated with hip dysplasia. The debilitating condition is often the result of poor breeding practices. If you get a puppy from a breeder, always ask to see the Orthopedic Foundation for Animals hip papers to ensure the puppy’s parents have good hips. A mix of beige and black is the most common color type for German shepherds, but solid black and solid white shepherds also exist. If you ever plan to show your pup, the American Kennel Club notes that white shepherds are disqualified. Although many German shepherds remain somewhat thin through the first two years of their life, they quickly fill out afterward. They’re large and powerful dogs, ranging from 22 to 26 inches and usually between 50 to 90 pounds, with females on the lower end of the spectrum. If they’re not properly trained, they can easily pull an adult to the ground if they run after something. German shepherds are prolific shedders. Brush one for 15 minutes and you’ll see hair floating in the air again 15 minutes later. Daily brushing is the only way to prevent a buildup of hair in your house. What Are the Smartest Dogs?